Last week in an article titled, Apple's Revenue Growth: A Dual-Track Bullet Train, I analyzed Apple's rates of revenue growth and the company's relentless geographic expansion that supports the fast rates of growth. In today's article, I am providing an overview of Apple's net income growth and the influences on the company's rising profitability. Apple is not only a fast-growing mega-cap, the company has defied conventional wisdom by increasing the percentage of revenue that flows to the net income line while revenue and in many cases market share, continue to rise across the company's major product lines. Over the most recent ten fiscal quarters, the percent of revenue that has reached the net income line has leaped from 21.54% of revenue in FQ1 2010 to 29.66% of revenue in FQ2 2012. Rising gross margin due to superb supply chain management, economies of scale, operating expense discipline and moderating tax rates have all factored into Apple's impressive percentages of revenue that have flowed to the net income line. The graph below illustrates Apple's gross margins over the most recent ten fiscal quarters. There's no disputing the fact the iPhone 4S has delivered very high gross margins. However, the high gross margins delivered by the iPhone 4S over the two most recent quarters were due primarily to economies of scale and not increases in average revenue per unit sold. In FQ1 2010, average revenue per iPhone unit was $638 versus $647 per unit in FQ2 2012. In FQ4 2011, average revenue per iPhone handset sold was $643. Revenue per handset includes the revenue generated by Apple through the sales of Apple-branded and third party iPhone accessories. My Apple Unit Sales page chronicles the unit sales growth of each of Apple's major device lines over the most recent fourteen fiscal quarters. The iPhone's high gross margins exemplify Apple's extraordinary supply chain management and the benefits of economies of scale. This is not an issue of rising revenue per handset. It's primarily an issue of unit sales growth. Apple is unique among the world's mega caps due in part to the company's extraordinary rates of revenue growth and extraordinary rates of revenue growth matched with consistently high gross margin. Over the most recent six fiscal years, Apple's recognized revenue rose nearly sixfold and earnings per share rose more than twelvefold. In the first six months of the current fiscal year alone, Apple's revenue rose 66.35% to $85.52 billion and eps rose 104% to $26.17 per share. At Friday's closing price of $574.13, the shares are trading at a conservative 14 times trailing 12-month earnings of $41.04 with more than $115 in cash standing behind each outstanding share. For investors, understanding Apple's potential for continuing strong growth is at least as important as an appreciation for the company's growth performance over the past six and one-half years. At Friday's closing price and lowly earnings valuation, the market is discounting Apple's continuing growth potential. There's no disputing the fact Apple designs and markets some of the world's most sought after consumer products. But Apple's success is driven by more than smart product designs and technological innovation. Relentless geographic expansion is an important catalyst for the company's fast rates of growth. If Apple were a bullet train, it would be a bullet train powered by two parallel tracks. The first track is exceptional product design and the consequential product popularity. The second track is expansion of product sales into new and emerging markets. On December 4, 2011, I published an article titled Where Apple Makes Its Money. 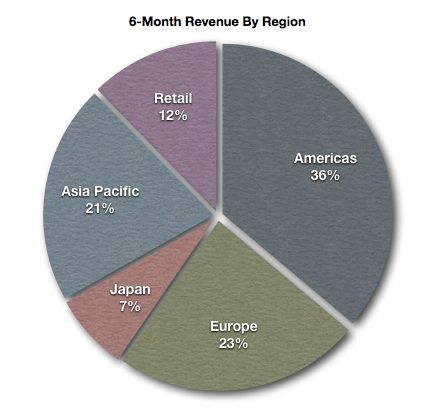 In that article I looked at Apple's revenue by region for the fiscal year that ended last September. In this article I'm presenting Apple's revenue growth by region for the first six months of the company's current fiscal year. Apple is now the world's largest distributor of music, a global bricks and mortar retailer and has more than 400 million iTunes customers around the world with online accounts backed by credit cards. By the end of the month iTunes-based app stores will be available to consumers in 155 countries and Apple's fastest rates of revenue growth are occurring in regions outside the United States.